Quality service, quality parts & pricing, and we guarantee it. We offer a number of services in the Waterford, MI area to keep your vehicle running properly at all times. All of our repairs and maintenance are carried out by our certified, expert auto service and repair technicians who have years of experience performing everything from oil changes to a complete engine overhaul. We use high-tech diagnostic equipment to guarantee your vehicle is repaired and/or serviced correctly the first time around, and we only use the highest quality replacement parts, filters, oils, and components when it comes to your car. 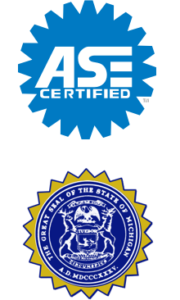 Our team is comprised of ASE Certified Technicians and State Certified Master Technicians. From oil changes to diagnostic trouble shooting our technicians can handle any auto service or repair you may need. We work hard to provide personalized customer service and repairs at a fair price. Using nothing but the latest tools and technology available, our team is able to diagnose and fix problems quickly and efficiently. So, the next time your car or truck cries out for attention, bring it in for some mechanical TLC — from the experts at Aaron’s Auto Service! We’re not just for breakdowns! The best way to keep your car from having a breakdown is to make sure that you are giving it the regular maintenance that it needs. Your vehicle has parts that need to ne replaced at regular intervals: tires, belts, pumps, fulids, filters, suspension, and many other parts should be replaced according to the manufacturer’s recommendations. We can tell you which services and parts your vehicle is due for. Call or come in and we would be happy to tell you about upcoming services you may need, and help you get them taken care of as quickly and affordably as possible! Brakes are one of the most important safety features on your vehicle. Keeping them serviced and repaired properly can make the difference between avoiding a crash or becoming a part of one. Regular maintenance is required to make sure they are in good working order and not worn or damaged. Brakes and tires are commonly overlooked. We recommend having your brakes check out every other oil change. This is important to not only your safety but also others. Stop by today and have one of our brake repair specialists take a look for you. Got a classic vehicle or a muscle car that needs service or maybe a performance upgrade? We do everything from engine swaps to exhaust headers to rear ends and more. We also do performance upgrades for your 4×4 and light trucks like body lift kits and more. Call us today and set up a time to bring in your classic or performance car! Want to save money on repairs and maintenance? We like our customers to come back satisfied time after time, so we offer discounts on repairs and routine maintenance. If you would like to receive occasional emails with coupons and specials, join our list. We will keep your email private, and we promise not to spam you.